Gikan kanako ngadto sa inyong banay, usa ka dakong pagtimbaya sa pagsaulog sa Sinulog 2014. PIT SENYOR!!! 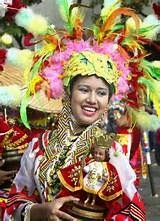 Sinulog is a grand celebration in honor of the Santo Nino or Child Jesus that Cebuanos celebrate on the third Sunday of the month of January. During the celebration, people attend a fluvial parade at dawn, a reenactment of the beginnings of the Christianization of the natives of Cebu and the culmination parade which is participated by different "tribal" groups including those from nearby regions and provinces. Participants and revelers chant the Pit Senyor while dancing the Sinulog dance. The Sinulog dance can be executed easily: Just one step forward and two steps backward.